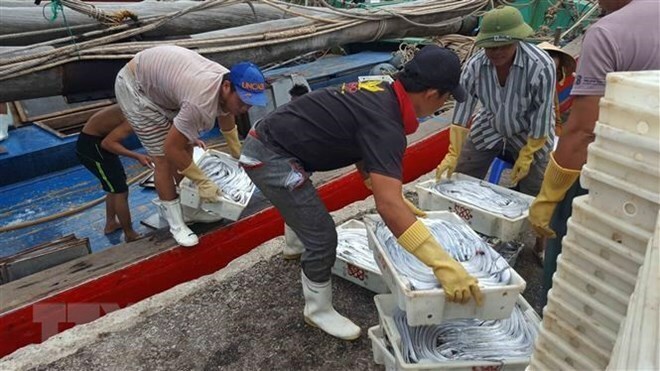 Hanoi (VNA) – The Ministry of Agriculture and Rural Development has asked the central coastal provinces of Nghe An, Ha Tinh and Phu Yen to take urgent actions and find solutions in response to the EU’s warning about illegal, unreported and unregulated (IUU) fishing. At the same time, the localities need to implement the Law on Fisheries, meeting requirements for sustainable and responsible fishery development, focusing on new regulations and those regarding IUU fishing, the ministry said. The illegal fishing in foreign waters must be handled completely and effectively, it noted. According to the ministry, there remain many shortcomings in implementing solutions to deal with the EU’s yellow card, relating to the supervision and inspection of fishing boats through seaports, illegal operation of fishing boats in foreign waters and the settlement of the violations, and camera installation on vessels. The EU is Vietnam’s second largest seafood importer, purchasing 350-400 million USD worth of seafood annually, accounting for about 16-17 percent of the total seafood export revenue. It imposed its “yellow card” ruling on Vietnam in October 2017, after the country failed to demonstrate sufficient progress in the fight against IUU fishing worldwide. Since then, the country’s seafood exports have faced various challenges.